I always think that the best gardeners are the methodical ones who do a little bit in the garden every day. That way the weeds never get a hold and the garden is always neat and tidy and open for visitors. Dogs and farms seem to go together. 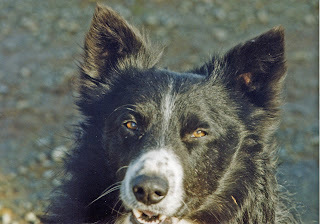 Every farm around here has a Border Collie (sheepdog) even if they don't have any sheep! But these dogs are usually kept out of doors and seen as "working dogs" - these range from the absolute master at rounding up sheep (which often changes hands for thousands of pounds) down to your average "mutt" who adores his farmer master and likes nothing better than providing companionship by riding round on the tractor all day. He was an ordinary dog. Words for paths and streams. A new one to add - provided by Glennis - rhyne (pronounced reen) a Somerset word for a stream. This word can also be spelt rean, reen and rhine. My poem "Message on a Wire" prompted a comment from Loren saying that he had never heard the word "beck" before. This then prompted a comment from The Solitary Walker listing some of the words for a stream and saying it would be interesting to know all the words used. So I sat down with a Dictionary and Thesaurus to see how many I could find. This set me thinking about passageways too - again there are so many variations throughout the country. So what have streams and passageways in common? Well until fairly recent times both would be used as the quickest way to get from A to B (streams go through the lowest points and are therefore likely to be the easiest walking if there is no footpath). When I think of the boring conversations I have had over the years about how people got from A to B (pre sat nav days) I think it is safe to assume that people have always talked about their journeys. Does this have a bearing on the large number of words in each case? Anyway - here is my list - can you add to it?If so please post a comment and let's see how many we can come up with. Here in Yorkshire we use beck unless the water is coming off the hill, in which case it might be gill. At last! The weather is right for making hay. At least, according to the BBC Weather Map it is, but while a mile away as the crow flies it is burning sun down here in the dip there is a sullen sky. But it is warm and it is fine so we proceed and soon a wonderful smell of hay fills the kitchen as the cut grass begins to dry. That smell never goes and in mid-Winter when the cats bed down in the hay barn on a cold wet day they bed down in the smell of Summer. At present the cats are not at all happy as their favourite sleeping place - the hay barn - gradually fills up again with bales. The tree sparrows are still honing their flying skills - taking off in a row from the privet hedge with mother directing operations, they skim over the grass, gradually losing height like overladen little bombers. The pup doesn't like going under their flight path as they almost part her hair. The swallows in the garage are fledged and learning to fly. We have taken to leaving the car outside - it's either that or give the car a wash every morning. The wild cranesbill - one of our most common wildflowers up here - is quickly going to seed. It is only when it has gone to seed that you see how aptly named it is. the stillness would be broken. and carted away to the stack. hung on the electric fence. Cistercian abbeys owned most of the land in this part of rural North Yorkshire in the twelfth century. They kept vast numbers of animals - one abbey alone had fifteen thousand sheep. Now these Abbeys lie in ruins, to be visited by tourists in the Summer months. They are well-kept and are havens of peace and quiet. I have tried writing a poem which captures this. Have I succeeded? Frustrating week on the farm as we are waiting for the right weather to make hay. This problem must have preoccupied farmers at this time of year for centuries. Now - although most grass goes to silage - it is nice to make a bit of sweet smelling hay as well. The grass grows long and goes to seed, the wild flowers die down and seed and the fields become a sea of reddish brown instead of the usual green. Earlier this week we saw an unusual creature in the long grass. At first we thought it was a stoat but when it streaked across in front of us we saw that it was far too big. We narrowed it down to escaped male ferret, polecat or mink. Then a friend did a bit of research and told us that polecats are not in this area - so either big ferret or mink then. Either way we don't really want it roaming here when we have baby curlew, pheasant, partridge, lapwing for sure and probably snipe, oyster catcher as well. All ground-nesting and chicks at a very vulnerable stage. We borrowed a humane Larsen trap from the local gamekeeper and baited it with a very dead (road casualty) pheasant - but no luck. Later in the week I passed a very dead black creature flattened on the road - but too mutilated to tell whether it was someone's beloved cat or the poor creature we had seen. Next week is the last full week to walk our tetrad checking on birds for the BTO Bird Atlas. On our last check we saw yellow hammers, curlews, lapwings, oyster catchers, little owls, merlin, buzzard - and all the others we expected to see. What an enjoyable pastime! We have a family of greater spotted woodpeckers in the garden - young still trying to perfect the technique of landing gracefully on the peanut feeder. and the brown hare hides in the long grass. to fill gaps and mend walls. and a thrush singing in the sycamore. The Farm: Although the farm house was built only eighty years ago, the land upon which it stands is ancient land. It lies on the Eastern edge of The Yorkshire Dales. A beck runs through the pastures, a water course which has been a thoroughfare for hundreds of years before the roads were built. The monks of nearby Jervaulx Abbey would walk the path by the beckside in The Middle Ages to see to their sheep, for most of this land belonged to the Cistercian Abbeys. Evidence of this is still reflected in the farm names. The meadow land is ploughed every few years and re-sewn to keep up a high standard of grass for silage. But the pasture land, with its stone walls and barns, has not been ploughed up within living memory. Violets and primroses hide in the hedge bottom in Spring. Buttercups and Ladies Smocks dot the fields in early Summer and where there is a bit of hedgerow amongst the stone walls, hazel catkins shine like lanterns in the very early Spring. This is ancient and much-worked land. Lynchets and rig and furrow farming methods show up when the sun is low in the sky and whenever a field is ploughed it gives up more of its ancient secrets. A neolithic stone axe, sharpened flints, small silver objects from the nineteenth century, lead spinning whorls, Victoria horse bells, crotal bells, broken clay pipes, early coins - all have been turned up in the last twenty years. In Spring the blackthorn blooms across the landscape, often accompanied by a spell of "Blackthorn Winter" weather. Then in late May, long after it finishes blooming in the South of England, the samne fields are thick with May blossom. The seasons come and go. The farming year follows its routine. We are only keepers of the land and when we have gone others will follow and we shall have left behind clues to our existence, to remind them that give or take a few fancy bits of machinery, nothing much changes.